The idea here is to separate the clients from the phone numbers. By doing this, if one client has several phone numbers, the name won’t be repeated in the database. There are two major components in PDI. The first one is called a job and the second – transformation. The difference between job and transformation is that the job is executing each step synchronously, meaning that each step waits for the previous to finish. On the opposite the transformation is running all steps asynchronously. 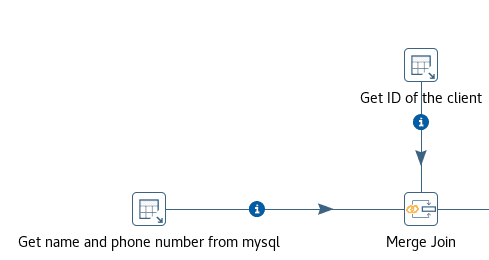 For our example we will first populate the postgres client table and after that we will populate the postgres phone_number table with data from the MySQL database. We need to populate the client table first, because the phone_number table has a foreign key pointing to it. So we will need one job and two transformations. 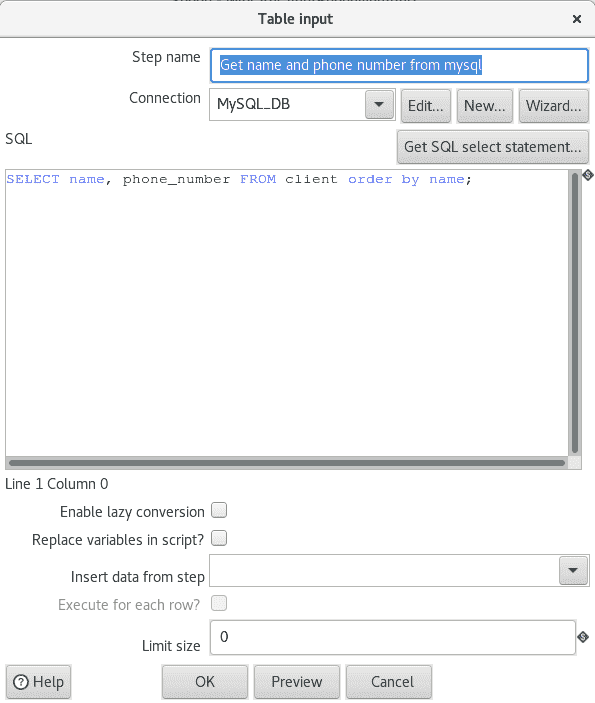 The job will execute the transformations one after another, the first transformation will populate the client table and the second transformation will populate the phone_number table. We use transformations to copy the data from one database to another, because we want the transfer to happen asynchronously. 1. We can start by creating the transformation that will populate the client table in postgres.Select from the menu File -> New -> Transformation. 2. Let’s save it first, so we can give it a name. Go to File -> Save As, and enter the name “MigrateClientNames.ktr”. 3. On the left panel, select the tab Design and search for a step called Table Input. 4. Drag and drop the step from the left panel to the right empty panel. You will see the step appearing. Now double click on the newly added step. You will need to download the latest jdbc driver for mysql and add it to the lib folder of the PDI tool and restart the graphical editor (spoon). 8. Now that we are ready with the data retrieving, let’s write it to the postgres database. Drag and drop step Table Output. 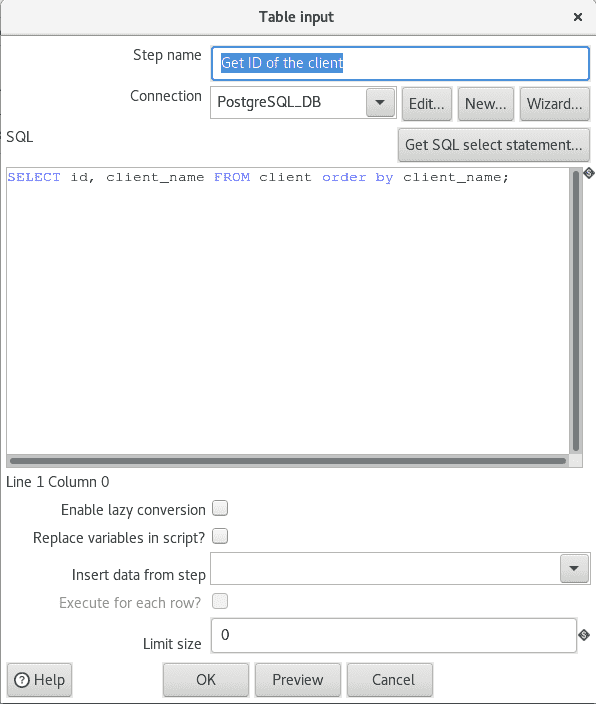 Give the step a name, for example “Populate distinct names into client table in postgesql”. 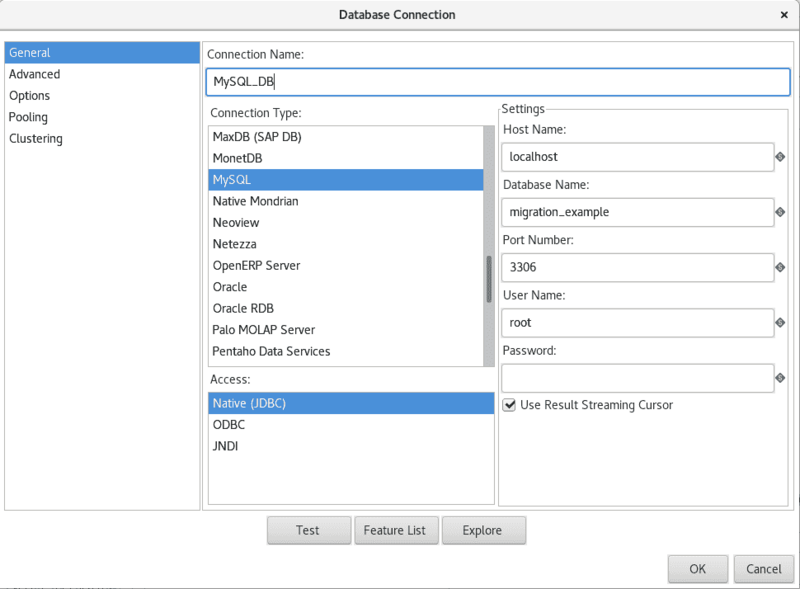 Create a new connection for the postgres database. 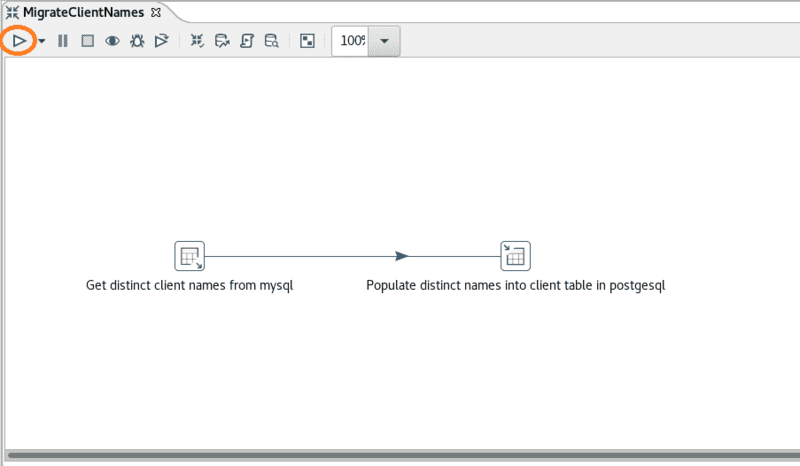 Populate the target schema with “public” and target table with “client”. 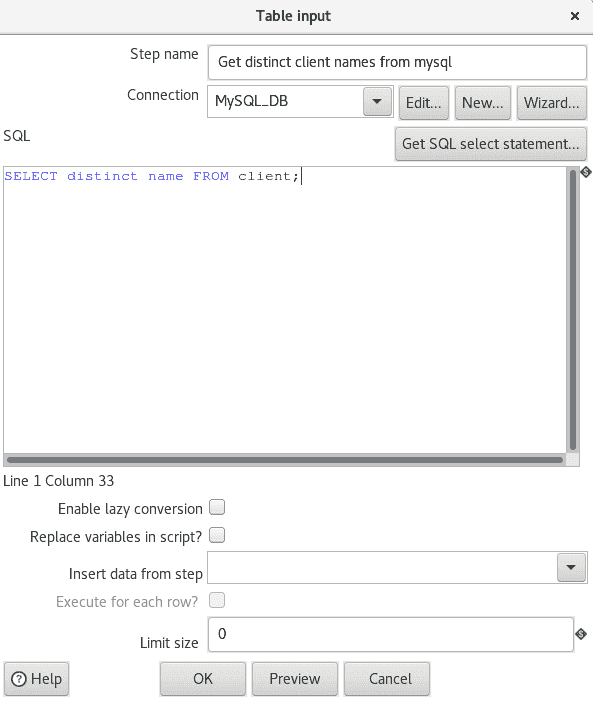 Click on the checkboxes “Ignore insert errors” and “Specify database fields”. 9. 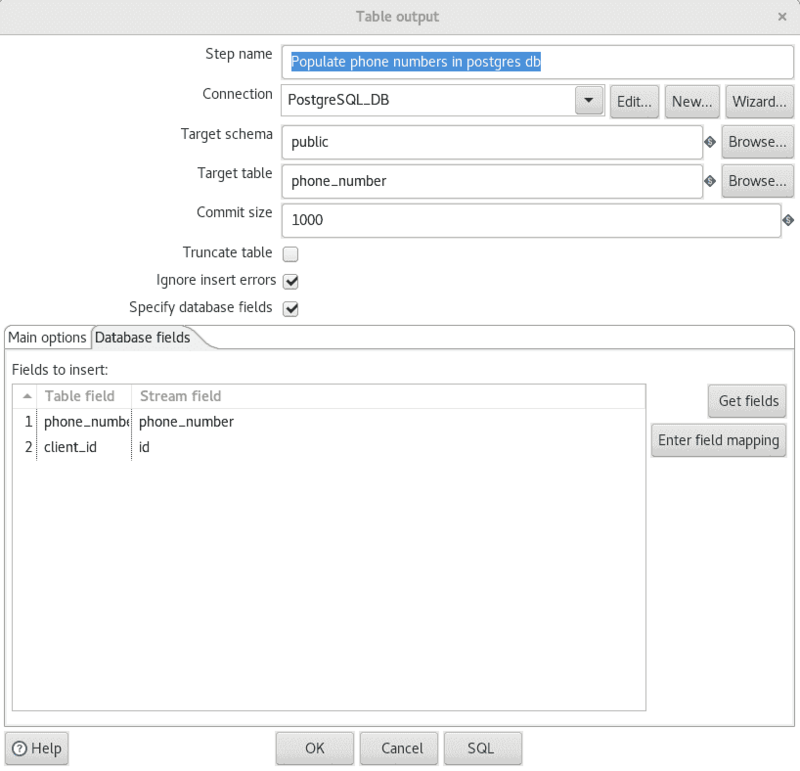 Select the tab “Database fields” and populate the fields as in the screenshot. 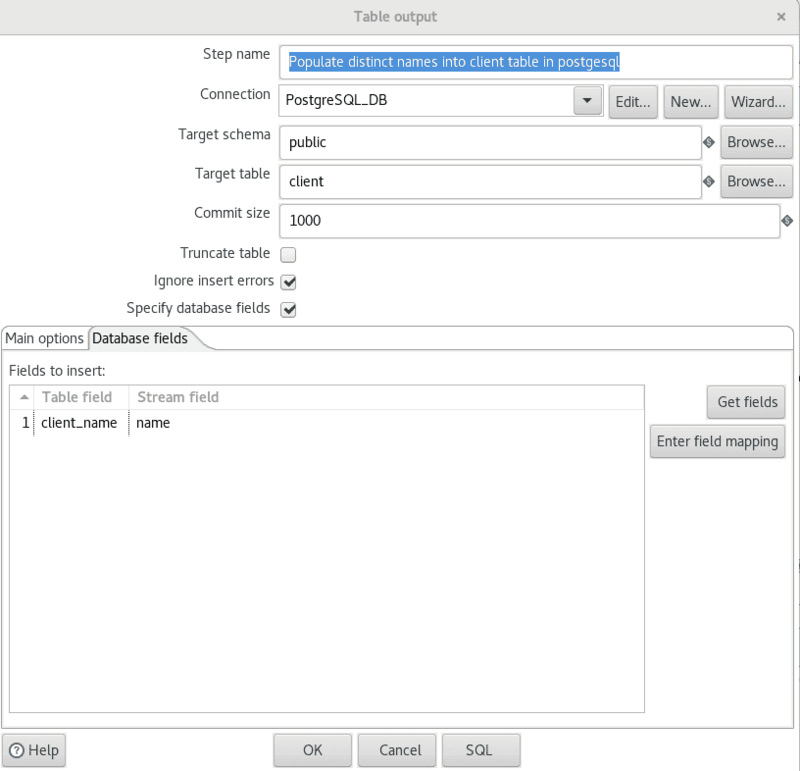 The Table field is the column which we want to populate in the client table, and Stream field is the field from which we will get the data. 11. Save the transformation. If you want to execute it, you can click on the triangle button marked with circle on the screenshot. Now that we are ready with the first transformation, we can create the second one. It is a bit more complex because we need data from both databases now. On one hand we need the phone number and name from the MySQL database and on the other hand we need the ID and name of the client from the postgres database to populate the foreign key. 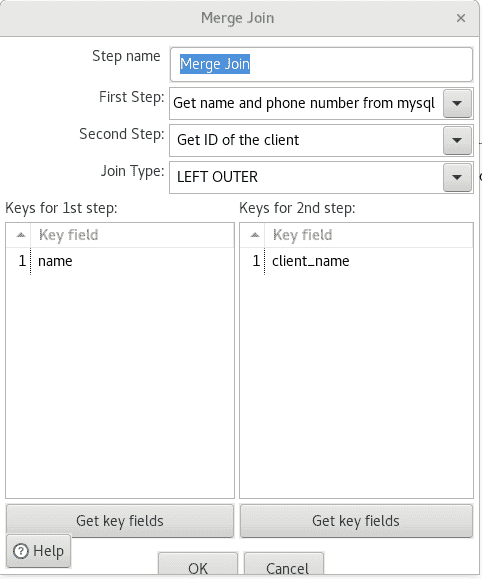 We will create two steps Table Input, one step Merge Join and one step Table Output. 1. Create a new transformation “MigrateClientPhoneNumbers.ktr” and save it. 8. Save the transformation. Click on the triangle button below the name of the transformation if you want to execute it. We are now ready with the transformations, however it might be inconvenient to execute the transformations one after another. We can create a job that will do the work for us. 2. Find the step START, it is a step without action. It simply marks the beginning of the execution. 3. Find a step Transformation. 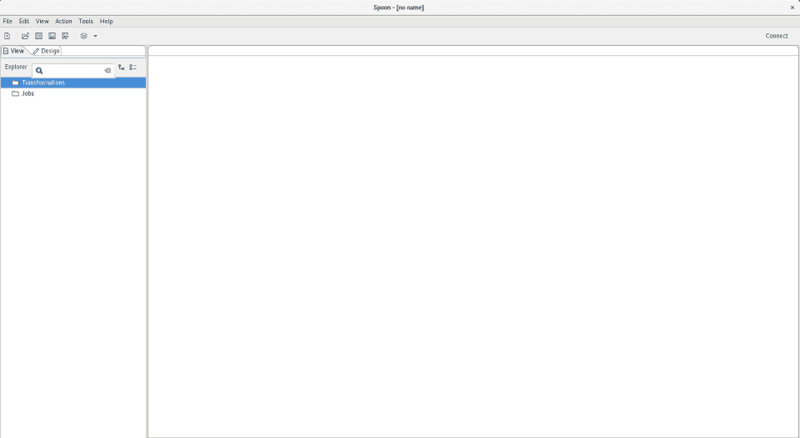 In the step configuration, you can select a transformation file. Select the first transformation that we created. 4. Create another step with the second transformation. 5. Now add Success step which is also without action. It marks the end of the job. There is more than one way to execute a transformation and a job. The most obvious one is through the spoon visual environment. We can run the transformation by clicking the triangle button or by selecting Action -> Run. Sometimes the PDI runs on a server, if the operations are too heavy to execute on a normal working environment. Usually the servers don’t have a graphical environment installed and the PDI offers a command line tool that is able to execute transformations and jobs. We can execute transformation from the command line by calling the pen.sh and pass the file as parameter. In order to execute a job we can use kitchen.sh and pass the job file as parameter. I hope you enjoyed the article. Do you know another way to handle such scenario?